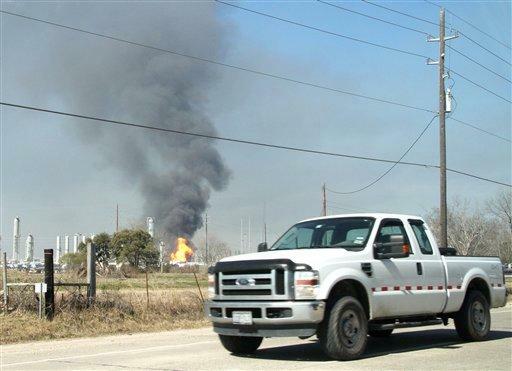 MONT BELVIEU, Texas (AP) - A liquid gas pipeline exploded Tuesday at a petroleum plant outside Houston, sending balls of orange flame and thick black smoke into the sky and leaving one worker unaccounted for, authorities said. The mid-day explosion burst open a line carrying mostly butane and propane at an Enterprise Products storage facility in Chambers County, company spokesman Rick Rainey said. The flames and smoke could be seen from downtown Houston, about 30 miles west of the fire, but the flames had subsided significantly by late afternoon. Rainey identified the unaccounted for worker as a contract employee who was supposed to be at the site at the time of the blast but didn't show up at a secure area where employees are told to report in case of an emergency. The area of the fire typically would include eight to 10 workers, he said. "There is one employee whose whereabouts are still being confirmed," Rainey said. "We are making sure we know where he is." Rainey said workers were aware of some kind of problem in the pipeline before the blast and heard a hissing sound. Employees in the plant's control room had started shutdown procedures when the line appeared to rupture, he said. "They were detecting .. abnormal operating conditions, and they started shutting down," he said. Firefighters were at the site in an isolated area of Chambers County. Mont Belvieu Police Chief Virgil Blasdel said it wasn't unusual for the blaze being allowed to burn itself out. No evacuations were ordered, although one school district kept children inside school buildings while the fire was burning. Operations returned to normal a few hours later when the threat of additional danger subsided. "After it ignited, it was huge yellow and flames everywhere," Steve Mears, who works near the plant, told Houston TV station KTRK. Mears said he didn't see anyone in the area when the fire erupted. Enterprise Products Partners L.P., based in Houston, provides services to producers and consumers of natural gas and other refined products and petrochemicals. According to company information, it has some 49,100 miles of pipeline and 196 million barrels of storage capacity for liquids and 27 billion cubic feet of natural gas storage. In the area beneath Mont Belvieu are salt caverns that make up the world's largest storage site for hydrocarbons. Numerous leaks, explosions and other industrial accidents, some of them causing fatalities, have occurred in the area's petrochemical plants over the years. An underground gas leak in 1980 forced 72 families from their homes for nearly five months. A decade ago, a pipeline ruptured and exploded and forced 40 people from their homes. AP reporter Jennifer Garske King in Washington contributed to this story.